After marriage, many people work extra hard to earn the life they dream of; not so for newlywed couple Stacy and David Foster. And it was as if good fortune did its best to pursue them. The register they originally wanted to get tickets from happened to be closed so the clerk pointed them to a different one. 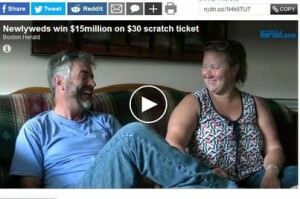 When they got home and scratched their $30 ticket for the state’s new “Supreme Millions” game, it turned out to be a big winner to the tune of $15 million. The winners opted for a one-time payment of about $6.8 million net of taxes. Their priorities include paying off student loans, buying a new house and a new truck.